Fifteen years ago the Subaru Legacy was the vehicle of choice for rural types who wanted to transport five people over any road, in any weather. 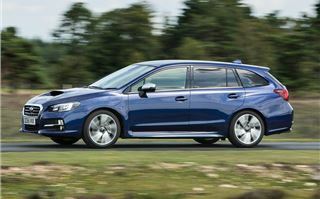 The Legacy's niche appeal was slowly eroded by an influx of superior all-wheel drive estates from Ford, Skoda and Volvo. 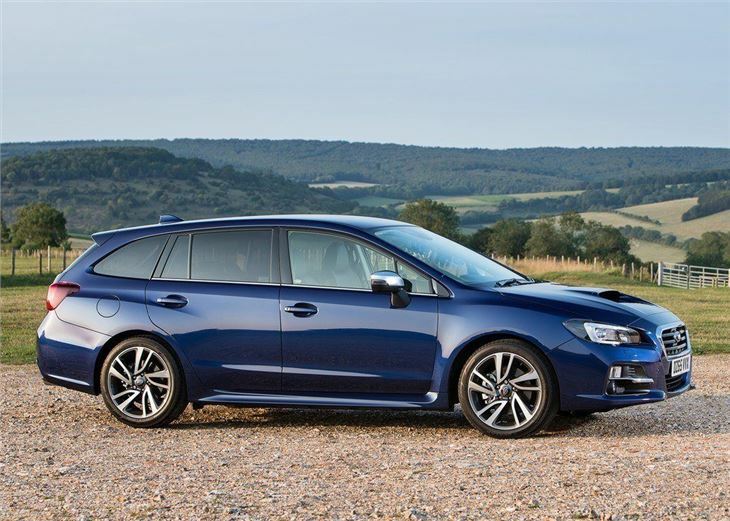 Now Subaru is hoping to fight back with the Legacy's replacement - the new Levorg. 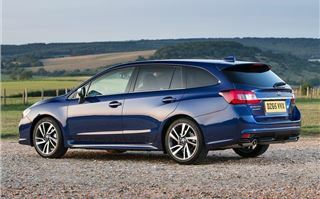 The bizarre Levorg name supposedly comes from a combination of the words ‘Legacy’, ‘Revolution’ and ‘Touring’. 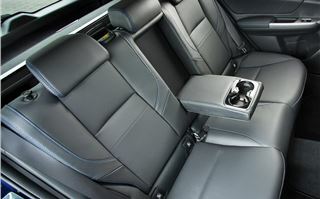 And the design has been inspired by the performance focussed Legacy estates of the late 90s and early 2000s. 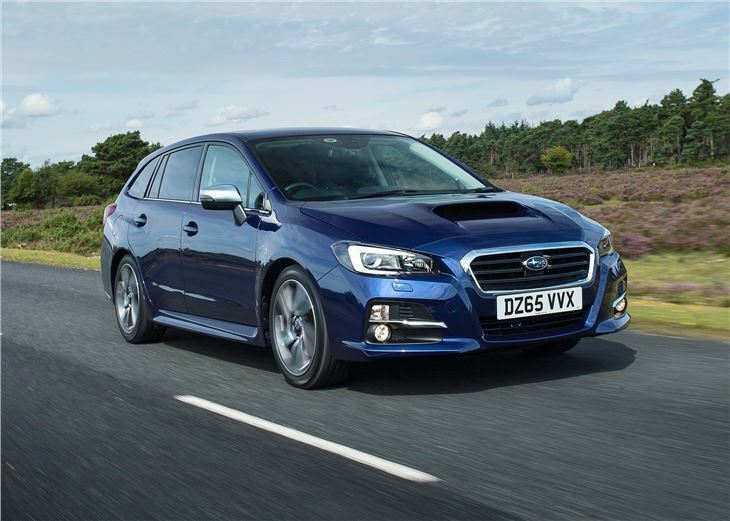 This means the Levorg retains its practical estate body style, but uses the same platform as the WRX STI. 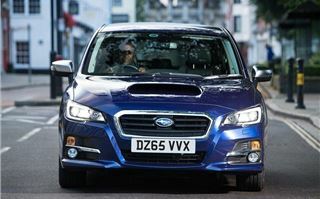 Power comes from Subaru's latest four-cylinder 1.6-litre boxer petrol engine with 170PS and 250Nm torque. 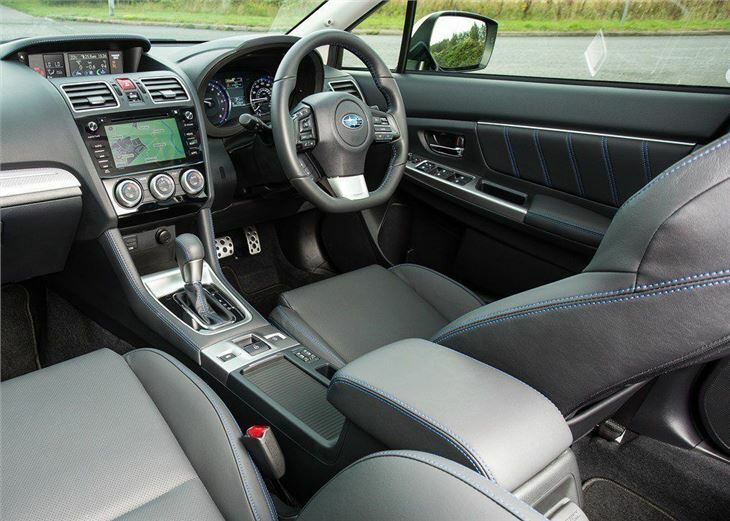 This is the only engine to choose from and there's just a single gearbox option- a Lineartronic CVT. 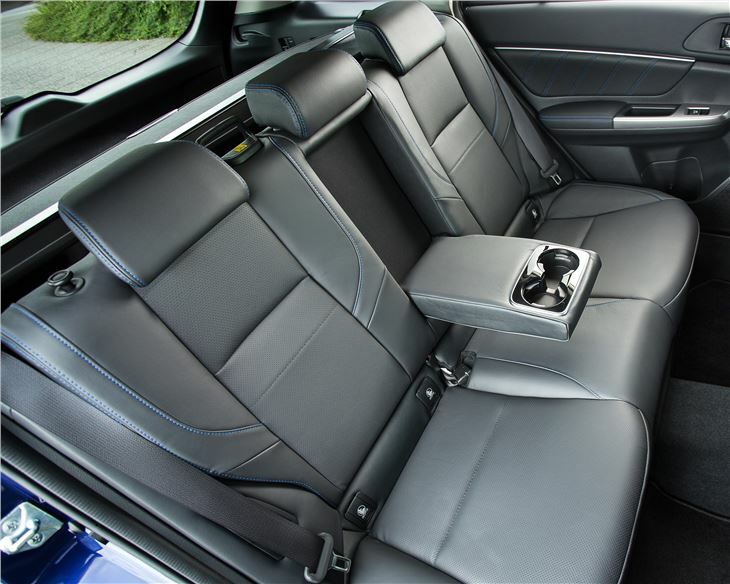 There's also only one trim - GT - but all models are well-equipped, with 18-inch alloy wheels, LED headlights, dual-zone automatic climate control, part leather seats and a seven-inch touchscreen all as standard. 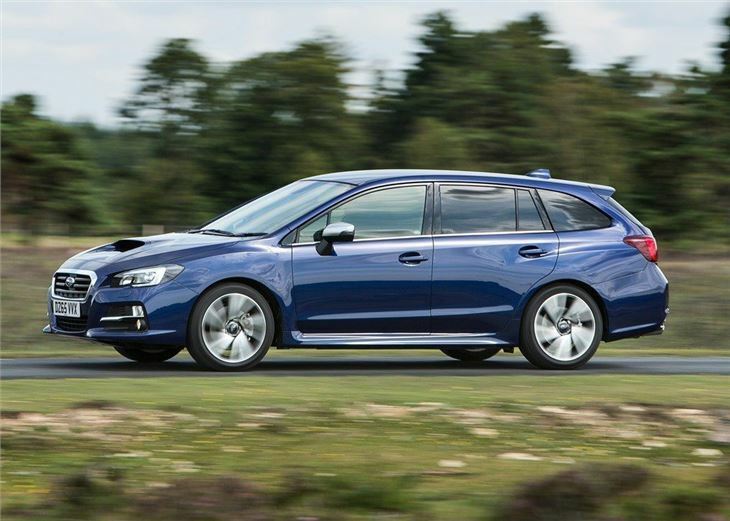 The Levorg is also keenly priced at £27,495, which pitches it up against the Skoda Octavia Scout, Ford Mondeo 4WD and Volvo V60 Cross Country. 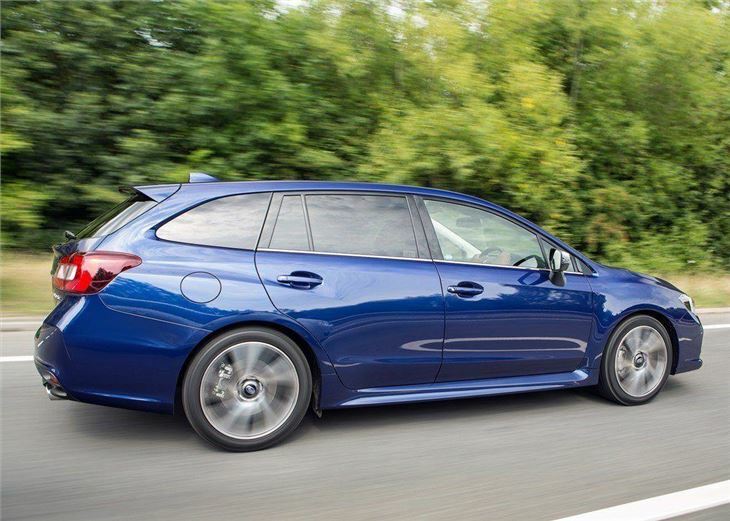 However, it's worth noting that none of Subaru's rivals offer as much standard equipment, which means the Levorg - on paper at least - is strong on value. 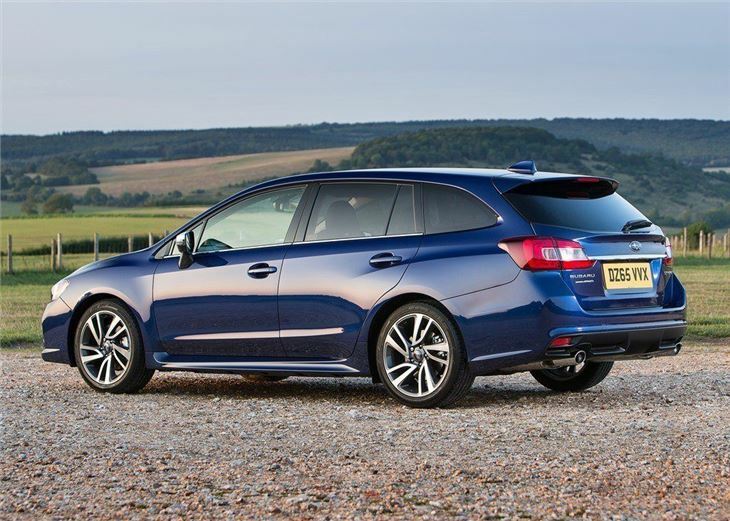 Like the Legacy, the Levorg majors on space and practicality, with a large cabin and a huge 522-litre boot that rises to 1446 litres when the second row of seats are folded down. 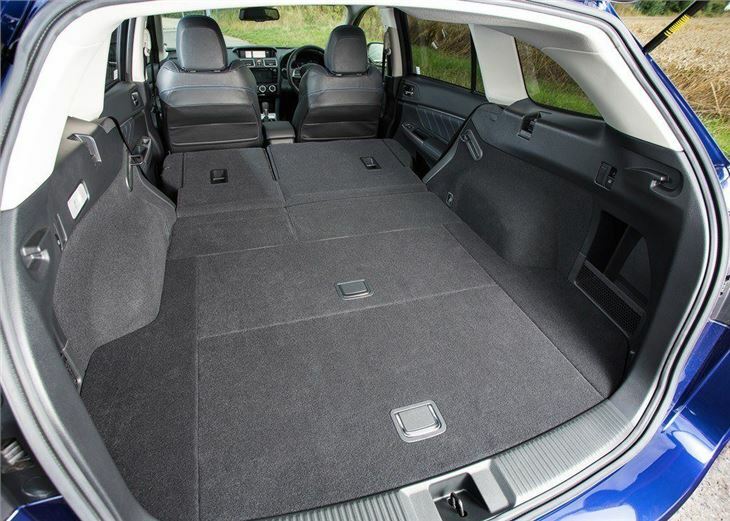 Admittedly, the cabin lacks the plushness of Volvo or the simplicity of a Skoda, but it's large enough for four large adults, with lots of head, shoulder and leg room. 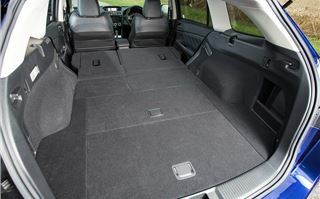 The rear seats are particularly impressive, with lots of lower back support and enough headspace and knee room for six footers to recline in comfort. General build quality is also good and everything feels like it has been fitted with care and a sense of longevity. 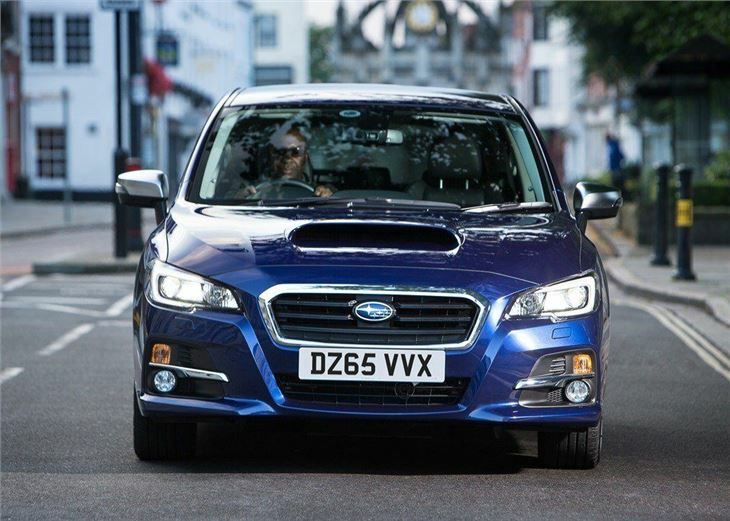 The seven-inch touch screen is a huge improvement over previous Subaru infotainment systems, with a simple and quick operation for the navigation and media settings. 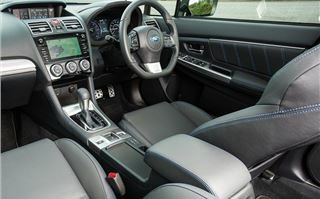 The dashboard also gets a useful central display - located just under the windscreen - which shows everything from the in-car temperature to fuel economy and performance of the four-wheel drive system. 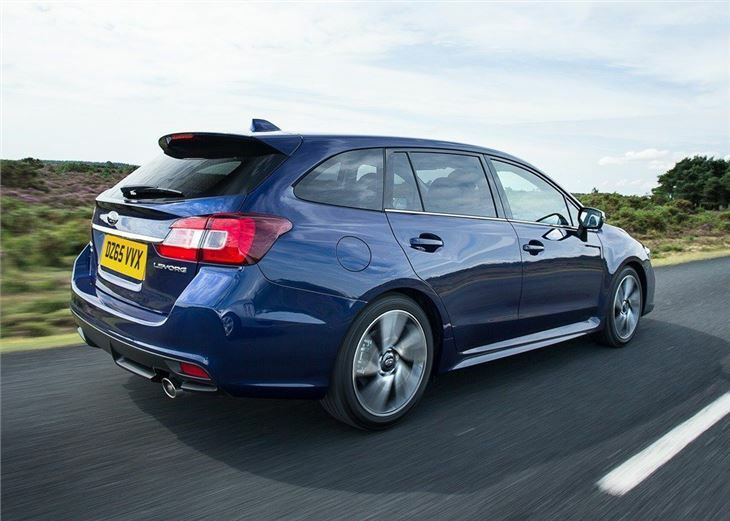 The Levorg handles extremely well on the road, helped in no small part by its superb all-wheel drive. 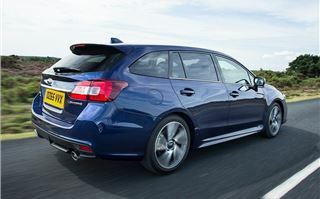 It doesn't take long to recognise the WRX STI origins as the Levorg corners with surefooted grace that is missing in many of its rivals. All models get active torque vectoring as standard, which - like the system found in the WRX STI - improves power delivery by applying light brake pressure to the inside front wheel in the corners to push more power to the outside front wheel. 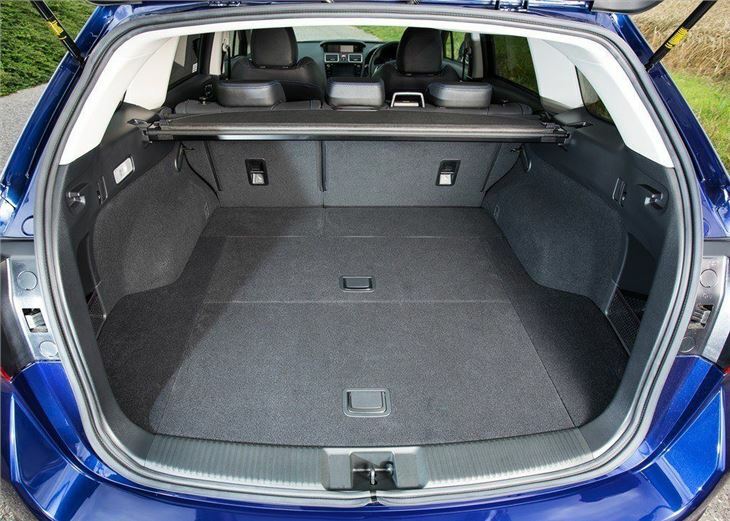 This means you can swipe through corners at an impressive pace, while the low ride height and centre of gravity provide a good balance for safe, predictable handling in all-weather conditions. 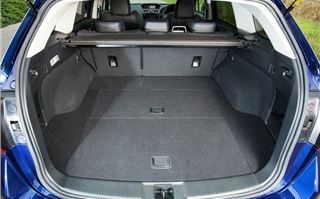 The ride quality is also rather better than many other performance-focused estates, with a composed drive that doesn't pitch in the corners or crash over potholes. Unfortunately the 1.6-litre boxer petrol engine fails to match the impressive all-wheel drive handling, with slow performance and limited torque. Indeed, even worked hard, the 1.6 unit feels lethargic, while the unrefined and whiny CVT gearbox makes hard acceleration a noisy and arduous experience. 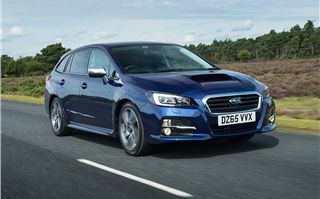 The Levorg's lack of punch could be overlooked if it was economical and cheap to run, but it isn't. On the contrary, it returns an official 39.8mpg and emits 164g/km of CO2, which means it sits in VED band G. In comparison the 184PS Octavia Scout TDI returns a claimed 56.5mpg, while taking a second less to reach 62mph. The Octavia is also considerably cheaper to tax, emitting 129g/km of CO2. 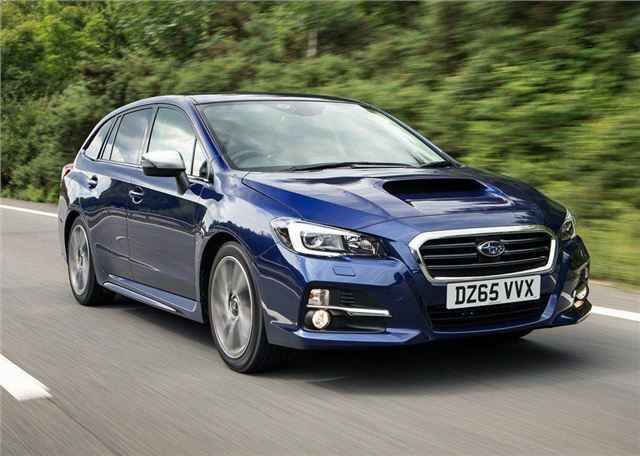 Given a diesel engine or a more powerful petrol - and manual gearbox - we'd wager that the Levorg would come close to matching its rivals and establishing mainstream appal, especially when you factor in its size, equipment levels and impressive ride. 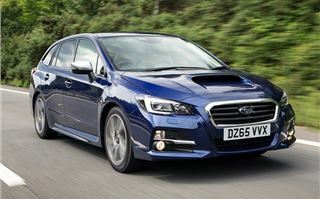 However, as things stand, the Levorg feels lost between being an efficient family car and a hell raising rally machine. 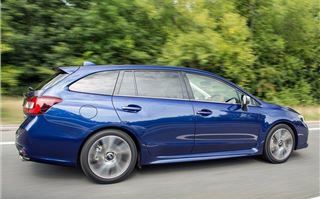 Sadly it's neither and represents a missed opportunity from Subaru rather than a return to the likeable traits of the Legacy of old. 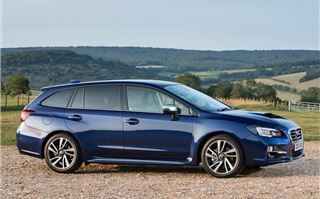 The Subaru Levorg is available to order now.